The definition of a mine, said Mark Twain, is a hole in the ground owned by liars. And this month the industry's biggest lie -- that it can be trusted with our water -- is once again on display as another mining disaster has spilled millions of gallons of toxic mining waste and chemicals into our streams, rivers and lakes. 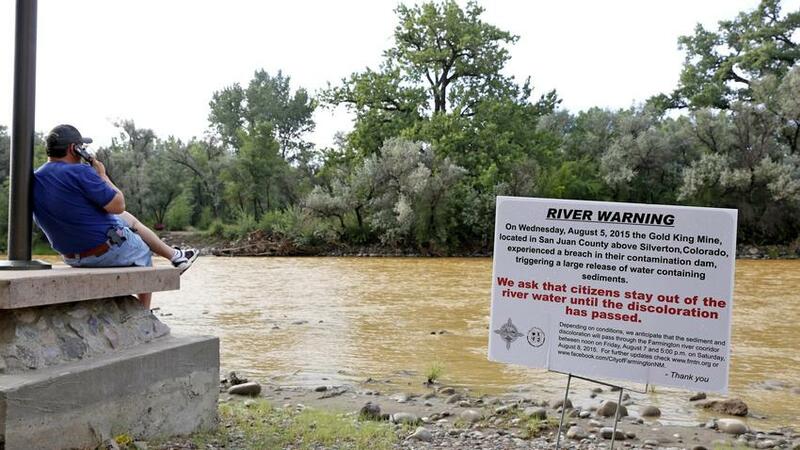 On Aug. 5, at the abandoned Gold King mine in southwest Colorado, a U.S. Environmental Protection Agency cleanup team inadvertently unleashed into a tributary of the Animas River a 3-million-gallon soup of toxic mining wastewater. The accident has closed the Animas indefinitely and threatens drinking water supplies, the economy and wildlife in the region, into New Mexico and potentially all the way to Lake Powell. This latest tragedy followed by one year almost to the day a pair of mine containment failures in Canada and Mexico. On Aug. 4, 2014, at the Mount Polley copper and gold mine in central British Columbia, an earthen dam built 17 years ago to hold mining waste laced with mercury, lead, copper and other heavy metals -- called tailings -- failed, inundating the Fraser River watershed. Three days later and 1,200 miles south at the Buena Vista copper mine in Sonora, Mexico, 10 million gallons of mining acid turned the Bacanuchi and Sonora rivers orange with poisonous chemicals, shutting down drinking water supplies, closing schools and affecting an estimated 800,000 people. Called by Mexico's environment minister the "worst natural disaster provoked by the mining industry in the modern history of Mexico," the spill was apparently caused by recently constructed but defective holding tanks. This trio of mining disasters is, or at least should be, a wake-up call. In an era of advancing climate change, fresh water is the indispensable natural resource, essential to life for everyone everywhere and becoming more valuable with each day of deepening drought. Yet staggering quantities of this precious resource are consumed by mining exploration, operations and long-term maintenance. Each year, roughly 180 million tons of tailings flow into rivers, lakes and oceans -- an estimate that leaves out the unpermitted contamination caused by containment failures like those at Gold King, Mount Polley and Buena Vista. Federal decision-makers should consider this damage as they decide whether to permit a host of massive mine projects around critical water bodies. Best known is a proposal to build the largest copper and gold mine in North America at the headwaters of the world's greatest wild salmon fishery, in southwest Alaska, which produces 30 million to 50 million fish each year. If the Pebble Mine were built as planned, it would generate an estimated 10 billion tons of mining waste laced with toxics -- about 3,000 pounds for every person on Earth -- to be contained forever in an area of high seismicity behind earthen dams as tall as the Three Gorges Dam in China. According to the EPA, the project poses a catastrophic risk to the waters of Bristol Bay, its wild salmon fishery and the $1.5 billion in revenue and 14,000 jobs it sustains each year. The battle over the Pebble Mine will set the stage for a long list of other proposed mining projects in risky proximity to critical waters: in Oregon, a nickel mine on a federally designated wild and scenic river that feeds the communities and natural wonders of the Northern California redwood coast; in Minnesota, copper and nickel mines that threaten the pristine waters of the Boundary Waters Canoe Area Wilderness; in Montana, the Black Butte copper mine on Sheep Creek in the upper watershed of the Smith River, a state-designated Blue Ribbon Trout Fishery and an essential source of irrigation and stock water for ranchers. Although mining industry advocates argue correctly that mining is essential -- copper, for example, is ubiquitous in our cars, phones, computers and appliances -- there's no denying that mining is a dirty business. According to the EPA, mining produces more toxic waste than any other industry -- about 25 percent of the entire U.S. toxics inventory. The permissive General Mining Law of 1872, written to encourage mining, is still in force even though the pick, shovel and pan were long ago replaced by giant earthmovers that gouge open pits more than a mile across and thousands of feet deep. Billions of gallons of water are consumed in production, pumped through miles of vulnerable pipelines and stored in open pits of acidifying waste; huge swaths of land are destroyed in the wake of closed, abandoned and inadequately remediated mines. After this month's mine disaster on the Animas, there is even less reason to believe the self-serving, impossible promises of mining executives who claim that with good engineering, they can protect our waters for centuries. Although cutting-edge technology should be mandatory for all mining today, not all areas are mandatory for mining. Assurances of safety must be skeptically reviewed. And some mining projects -- such as the Pebble Mine -- just aren't worth the risk. This piece originally appeared as an op ed in the Los Angeles Times on August 13, 2015.